"The Diving Bell and the Butterfly" is the remarkable true story of Jean-Dominique Bauby (Mathieu Amalric), the editor of the French magazine Elle, who had a paralyzing stroke that left him in a condition called "locked-in" syndrome. He couldn't move from head to toe aside from being able to blink with his left eye. This blinking became his only form of communication through the help of a gentle speech therapist (Marie-Josee Croze). She arranges an alphabet in the order of most frequently used letters and reads it off to him, waiting for him to blink to choose a letter. Soon, a caring amanuensis (Anne Consigny) takes her place, and it's in this way, letter by letter, word by word, blink by blink, that Bauby wrote his personal memoir, "The Diving Bell and the Butterfly," in 1997 shortly before his death. It's an amazing story, but how does something like this translate onto the screen? Adapted by director Julian Schnabel and screenwriter Ronald Harwood, they transform seemingly impossible material into a beautifully filmed experience. Great creativity has been exercised to take us inside the mind and memory of Bauby. We're not merely shown a man sitting in bed; we're shown what he sees, the people around him, and his viewpoint, and we dive deep into his memories and fantasies. In the first moments of the film when we're looking through Bauby's single blurred eye with doctors hovering over him; we hear him speaking but soon realize that only the audience can hear him. Bauby gets his right eye sewn shut, and as we witness it, we hear him screaming in horror, and yet, nobody else can. We're shown Bauby's past, revealing that he was a womanizer who left Celine (Emmanuelle Seigner), the devoted mother of his children. He leaves her for a mistress who doesn't even have enough courage to visit him in his condition. Even at the hospital, Bauby continues to be surrounded by beautiful women including his speech and physical therapists, and even the still devoted Celine, who still comes to his bedside every single day. Bauby even creates a fantasy lover who, in his imagination, keeps his ability to have lust and love full and alive. All of these people in Bauby's life keep reminding him to stay true to the man he is inside, and from that, he begins to frown upon any thoughts of self-pity. Everything we hear in the film is filtered through Bauby's consciousness, which leads to moments of genuine insight and humor. Mathieu Amalric plays the man of Bauby in two respects. He is the unmoving man who talks to others one blink at a time, and he's the man very much alive in memories. He shows great tenderness in a scene between Bauby and his father (Max von Sydow), which is their last meeting before Bauby's stroke. Later in the film, his elder father tries to speak to his son again in a devastating phone call to the hospital. Greatly colorful cinematography from Janusz Kaminski protects the film from being a downer and actually turns it into a fascinating exploration of feeling and a celebration of life. Highly experimental camera techniques mixed with human emotion and experience combine to make something daring, different, and wondrous. These filmmakers have created something of a small miracle. This is a movie so imaginatively made, so in tune with the indescribable something that makes life what it is, and so in touch with the pleasures of everyday senses that it's surprising. It's a masterful and viscerally emotional film, one that is miraculous in how beautifully it has been pulled off without falling victim to becoming locked-in itself. It opens up to us with visual ambition and gorgeous storytelling while approaching delicate subject matter with honesty and passion, telling a true story that to just say is inspirational would be an understatement. 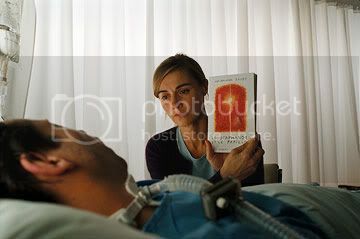 "The Diving Bell and the Butterfly" is French, but it shares a message that is ultimately universal on the strength of human consciousness and the human spirit. I mean, to write an entire memoir essentially in your mind, that's an amazing feat.